Integrated marketing resource management company, Vya, has acquired two new Xerox presses that deliver faster print speeds, greater availability and expanded color capabilities to better meet their client needs. The two new presses – a Xerox iGen® 5 and a Xerox Color Press 1000i – were installed in November, replacing two Xerox iGen3 presses. Both of the new presses offer enhanced color capabilities by complementing CMYK with optional fifth toner stations. The iGen 5 enables the use of orange, green or blue to expand the achievable color gamut and more accurately match Pantone colors. Vya is using it to improve brand color matching in brochures, direct mail, posters, flyers, manuals, tags and other printed marketing materials. The Color 1000i’s optional fifth toner station is for metallic gold and silver, as well as clear toner, which Vya is using to add texture to its pieces. The iGen 5 also enables Vya to print on larger sheet sizes – as large as 14.33 x 26 inches – and it provides industry-leading press availability of 85 percent. “We have already seen decreased maintenance with the iGen 5,” Brokamp said. Vya, formerly DocuStar, offers businesses a full range of integrated marketing resource management tools to help clients simplify and localize marketing efforts. The company combines more than 20 years of print fulfillment experience with the latest technology to provide a platform to help companies customize their marketing, messaging and materials. Website: www.vyasystems.com. 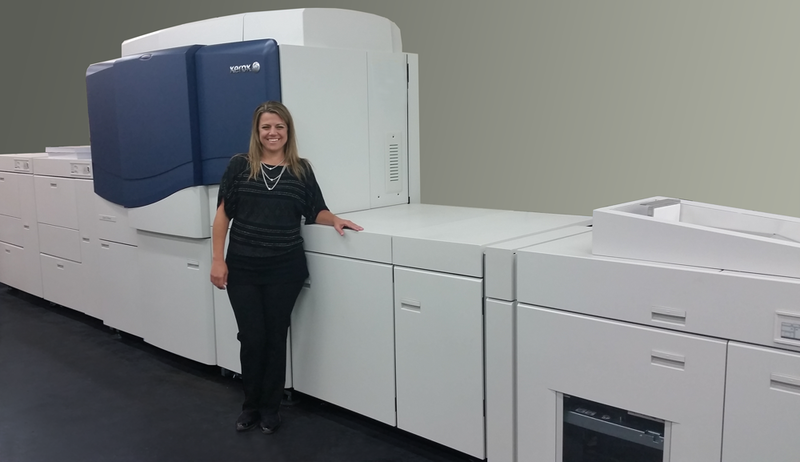 Vya COO, Kandi O’Connor next to the new Xerox iGen 5.